It’s been about a week since digitaltempest favoured me with a Pinterest invite. I am now over obsessively pinning everything I have ever found and loved on the internet. Well, no, not everything. But I no longer have little lists beside my computer so that I can look things up to pin on my various boards. I can’t help it! This is what I was using Tumblr for, but obviously without nearly as much organization (and a lot more crazy fandom), which is really what I love most about this site. The internet organized into neat little boxes. Pinterest has also satisfied my bucket list desire to start a designer Barbie collection. My Barbie board now serves as a guilt-free way to collect, without burning my bank account or shelf space. 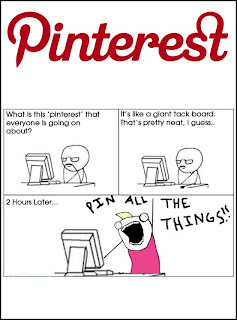 Apparently, what us pinners are doing could very well get us in plenty of trouble, but, you know, internet. We’ll clicky the accept button and remain blissfully pinning in ignorance until someone sues us otherwise. I looked up PinInterest on a website that tracks how popular a site is and it was ranked 16th! Even Tumblr never hit the top 20 in the U.S. But the problem will be when Flickr is joined by others claiming that the copyright on some of their pictures belong to them and cannot be used.